Traceless 2K Hair Tie . 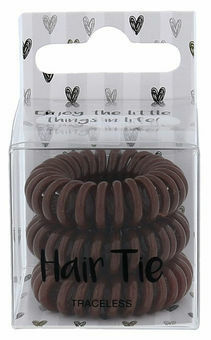 The unique shape of the 2K Hair Tie keeps your hair perfectly together. It creates minimal pressure and leaves no traces in your hair. So the hair does not tilt or crack like using a classic rubber band. You can wear the 2K Hair Tie as stylish wristbands all day without visible traces of puncture. Try the 2K Hair Tie Original Elastic Bands. Suitable for all hair types.